The moving riser tube is chrome plated for durability and ease of cleaning. The top panel is laminated with a PVC moulded surface and there is a safety edge moulded into the top on all sides to prevent plates etc from sliding off and also to control any spillages that might occur. The table can be easily lifted without having to operate the control handle and will remain at the position required with no further adjustments and can only be lowered by operating the control handle. 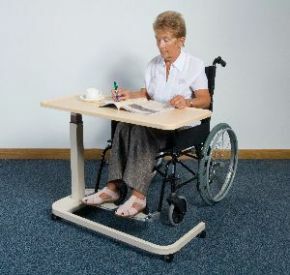 With a horseshoe base design, this table is ideal for wheelchair use, allowing wheelchair users to comfortably pull themselves right up to the table.